Worked on the "Development 1" task of Army Mapper 3.0, the US Army's enterprise Geographic Information System (GIS), used for a number of functions, including reviewing the utilization of real property (buildings, roads, parking lots) and other infrastructure on U.S. Army bases. Army Mapper is used by the Office of the Assistant Chief of Staff for Installation Management (OACSIM) as a tool to visualize the current state of the Army's resource management across Army installations (ie, bases) worldwide. Work in the Development 1 task included designing and creating exceptionally advanced, user-facing geo/database query tools, allowing Common Access Card (CAC) authenticated end users to visually construct and save ad hoc queries of what amounted to complex SQL joins. These joined data sources, cutting across any number of tables, could then be concurrently queried by data values and geospatially. Other tasks included creating a Range Query Tool (RQT) that allows Army support personnel to quickly find firing ranges by munition or weapon type, or by querying a number of other range characteristics. Recent internet map service programming has taken a clean break from the ESRI-specific solutions to which I contributed while at NOAA CSC. 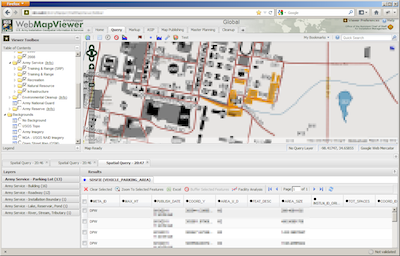 Army Mapper, the US Army's enterprise Geographic Information System. This system uses ESRI, Oracle Spatial, and open source libraries to provide its functionality, including MapServer, OpenLayers, and ExtJS. While at the NOAA Coastal Service Center, I modified and maintained Internet mapping sites that use ESRI's MapObjects, and, even more commonly sites created with ESRI's internet mapping technology ArcIMS. I have created a reusable template "from scratch" for ArcIMS using ASP. This extensible template sped site development considerably as it was designed to be quite easy to customize. These applications ran on Microsoft IIS. To date, the most popular site has been the Historical Hurricane Tracks Tool, which allows users to query a system that includes over one-hundred years of tropical storms on the East Coast of the United States to see what storms might have passed through their neighborhood. This site was highlighted at USAToday.com in a weather article. An in-depth consideration of the technologies used was given as part of a presentation at the the ESRI Users' Conference, summarized in this abstract. Another complicated site is the "RAster Data Delivery System" or RADD, pictured above. This site uses ArcIMS to provide visualization aids to users who want to download C-CAP Data from around the country. My responsibilities included not only the creation of the ArcIMS interface, but also the Java middleware that forwards requests to IMAGINE (a GIS tool suite that can clip raster data), zips the results with customized metadata (also made by the middleware), places the data on a publicly available ftp site, and emails the user that their request is ready. NOTE: CSC has moved from ActiveX to Java for IMS. The hurricanes site has been largely rewritten, but the core functionality is essentially the same as when we initially released it.